GraspIt! was created to serve as a tool for grasping research. It is a simulator that can accommodate arbitrary hand and robot designs originally developed by the Columbia University Robotics Group. It can also load objects and obstacles of arbitrary geometry to populate a complete simulation world. The GraspIt! engine includes a rapid collision detection and contact determination system that allows a user to interactively manipulate a robot or an object and create contacts between them. Once a grasp is created, one of the key features of the simulator is the set of grasp quality metrics. Each grasp is evaluated with numeric quality measures, and visualization methods allow the user to see the weak point of the grasp and create arbitrary 3D projections of the 6D grasp wrench space. License: GraspIt! is available under the GNU General Public License. Platform: GraspIt! is cross-platform, and has been tested on MS Windows and Ubuntu Linux. Download: Github (https://github.com/graspit-simulator). The older releases can still be found at (https://github.com/graspit-simulator/graspit/releases). Grasp-Planning: Automatic grasp planning is a difficult problem because of the huge number of possible hand configurations. Humans simplify the problem by choosing an appropriate prehensile posture appropriate for the object and task to be performed. By modeling an object as a set of shape primitives (spheres, cylinders, cones and boxes) we can use a set of rules to generate a set of grasp starting positions and pregrasp shapes that can then be tested on the object model. Each grasp is tested and evaluated, and the best grasps are presented to the user. 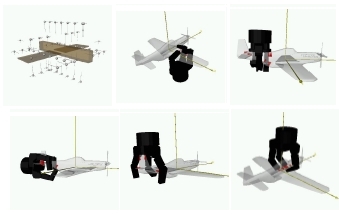 The primitive model used for the toy airplane with the generated set of grasps to be tested, and five of the best grasps found sorted in quality order. Dynamics: During each time step the system solves for the motion of each body. The constraints are formulated as a linear complementarity problem which can be solved with Lemke's algorithm. Smooth joint trajectories can be created and PD joint controllers apply the necessary torques to carry out a grasp. Snapshots during the dynamic simulation of a grasp formation, with the Barrett hand picking up a telephone. Andrew Miller and Peter K. Allen. "Graspit! : A Versatile Simulator for Robotic Grasping". IEEE Robotics and Automation Magazine, V. 11, No.4, Dec. 2004, pp. 110-122. We recommend starting with that paper for the best introduction to the system. Most of the papers below address individual features of the simulator, you can read those that are relevant to the particular project you are working on. The list of publication is presented in chronological order, from oldest to newest. For each publication, we also provide a short description of the parts of GraspIt! that it is most relevant for. [pdf].